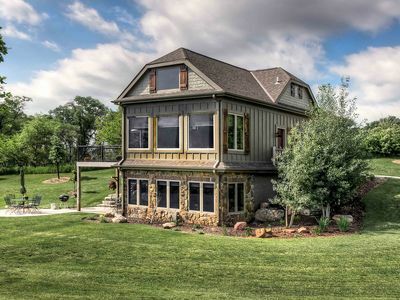 This luxury cabin is located on Spencer Hill, a secluded treed acreage conveniently located just 30 minutes from Omaha or Lincoln and footsteps away from Lake Wanahoo. This splendid retreat is ideal for couples, families, business or social gatherings or anyone wanting to get away from the hectic pace of life. Due to parking and bathroom restrictions we limit events to 30 people or less. Because of our desire to offer solitude for others we are no longer booking weddings. The cabin features a 2400 sq. ft. open floor plan decorated with modern/rustic furnishings, knotty pine cathedral ceilings, reclaimed antique barn wood flooring and granite countertops. The 3 bedrooms/3 baths are appointed with luxury linens. The 4+ acre property is 600 ft. from Lake Wanahoo which offers biking, hiking, kayaking, fishing and is a bird watcher's paradise! The cabin is situated on 4.5 beautifully landscaped acres with complete privacy. Many large windows offer awesome views of Lake Wanahoo. The only noise is that of Mother Nature and an occasional crowing rooster. A tepee is situated on the property and is a great place for telling stories to the little ones in the dark! Main floor has a fully equipped kitchen, a great room with dining capacity for 10-20 and amazing views of the lake, a gas fireplace, a master bedroom with a queen size log bed. The deck is accessible from the great room and master bedroom and is equipped with a Weber stainless steel gas grill and has dining capacity for 6-10. The cozy loft features knotty pine ceilings and is furnished with a king size bed. The loft has a full bath, 2 built-in bunks (1 is child size), a small deck for enjoying your morning coffee and a small hideout for the kids. The lower level has more large windows with views of the lake, a bedroom with 2 sets of bunk beds (top are for 80 pounds or less) a full bath and a flat screen television with a DVD player and DIRECTV. There is also a full size sofa sleeper for extra guests. The walkout is to a patio equipped with a Weber charcoal grill and has dining capacity for 6. There is a fire pit adjacent to the patio with firewood and skewers for roasting marshmallows. Music is available through a SONOS adapter and can be heard throughout the cabin and outdoors via built in speakers. The quiet town of Wahoo is located 1 mile south and offers many conveniences from fast food to restaurants, banks, a bakery and two grocery stores. The town also has an 18-hole golf course, a large park and swimming pool and is the site of the Saunders County Fair. Omaha's world class Henry Doorly Zoo, the College World Series and the annual Berkshire Hathaway meeting are an hour's drive away. The Wahoo Municipal Airport is also located just 1 mile east. We are sorry but due to allergy issues we cannot accommodate pets. We also do not permit smoking or excessive drinking on the premises at any time.